Besides our comments and suggestions, you could also refer to the China tour reviews of our former clients from US to get a general understanding of our service and share their experience which could make your tour more successful. And we will help you to get their permissions if you have the interest to contact some of them directly by email. I am sorry it took me so long to write a review. After China I was in Chile, Morocco and now leaving for another trip. I just posted review on TripAdvisor. I hope you can see it tomorrow and will be happy with it. When it done, I will link that review to your website. Thank again for wonderful experience in China. We would like to thank you for all your help and support to make our visit to China a success. We are still very impressed with all the points of interest and all the information the tour guides delivered to us. Please let them know that we enjoyed their company very much ! Once again than you very much! A. I want to thank you again, Dragon Delight, for the wonderful planning you did for our trip. Never have I worked so seamlessly with a tour company that really planned my trip the way I wanted to see China! While planning I changed the places, cities, mode of transportation (train vs. plane), tourist sites, etc., and Dragon Delight worked with me every step of the way to make the whole trip smooth and delightful. 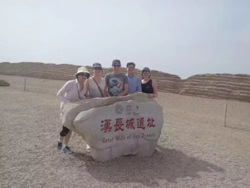 While Beijing and Xian were a must for the first-time visitors traveling with us, we all very much enjoyed the other sites we visited as well: Dunhuang was unforgettable, Chengdu was delightful and Huangshan was sublimely ethereal. Your organization and care for the details of our trip are very much appreciated. This is the fourth time I have used your travel agency in my seven trips to China and I cannot recommend you enough to everyone I know. You make travel in China truly wonderful! B. Dragon Delight were great. They arranged a wonderful trip for six of us that spanned five cities in two weeks. We went all over--Dunhuang, Xi'an, Chengdu, Huangshan, Beijing--and Dragon Delight organized each stage of the journey perfectly. In my view, Dragon Delight is a great choice for first-timers and experienced travelers alike. we have returned from our trip to your wonderful country. All in our group had a really wonderful and memorable trip to the places you arranged for us. Thank you for all the work that you did in making the arrangements for us. Your attention to the details and our needs were planned and organized very professionally, consistent with the high ratings given by others. The tour guides were very good and in all the places we went they were professional, helpful and very nice as persons. We were pleasantly surprised at the level of English spoken by all the guides. The accommodations were good, although I would make a general comment applicable to all the hotels. They should vacuum the rooms after each guest and make a special effort to remove stains and other spots left by the guests. The food was excellent in all the hotels and other restaurants we frequented. As Asians we really appreciated the good Chinese cuisine. Thanks for the Peking Duck! While we were not able to communicate verbally, we found the people to be genuinely warm. Our only complaint was that we were not able to spend more time in China, especially Shanghai. Thank you again, and I hope to visit China again. We thoroughly enjoyed the Century Legend tour and were impressed by the service we received from all of the Dragon Delight agents along the way. You were great at communicating with us from first contact to completion. Indeed, we had a delay and scare with the boat accident on the Yangtze, but recovered nicely. The boat trip actually exceeded our expectations and we had a lovely, relaxed time on this scenic tour. The staff on the boat was well trained and always helpful. We did all the side excursions and enjoyed them. Thank you so much for your service and I will not hesitate to recommend you to my friends. Everything was Fine & as you said it would be. Didn't get your e-mail about Jassy untill we got home. However their Jassy was holding the "Page Family"sign as you said it would be. Jassy was GREAT, kind, helpful, always asking how she could help or get anything for us. She gave us wonderful suggestions on where to buy items, on Food and shared 100's of Facts about China, Beijing, The Great Wall, the schools, sports, and many other areas as well. The Jade Factory was very interesting and my wife, Belinda spent so much time shopping there we skipped the Ming Tombs. Lunch was a wonderful delight with Jassy sharing many details about the food, local customs. Then the Wall......I am sure you have heard it all before.....The Great Wall of China.....was The Great Wall of China! We will never forget our time there. Please pass this note on to Jassy as well. She gave me her e-mail address but I don't recall where I put it & have not found it yet. Jassy, You made our short stay come alive!! Thank You, Thank You!! Linda Thank You also for making this happen for our Family!! over 100 years old. They also helped connect us with local residents who had personal knowledge of our family's missionary history in the area. The result was a very personal experience that left us feeling incredibly fulfilled and connected to our ancestors and the local communities. 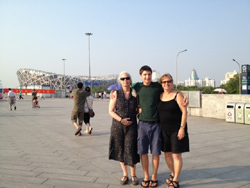 PS: Karyl and her daughter Andrea visited Fuzhou in November 2014 to reconnect with their beloved ancestors by walking in their steps in Fuzhou, Kuliang and Minqing County. If you are interested in it, you can click here to know more. we had a delightful time in China; thank you so very much for all you did to make our trip so special. I’ve attached a few photos to share with you. In one of the pictures is our guide in Xi’an, Lee (English name); he was GREAT. Lee is passionate about his work, enthusiastic, and excited about sharing information with the clients. 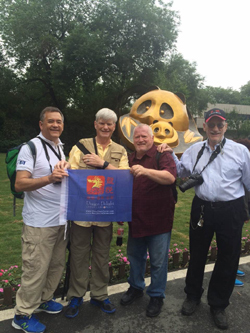 We were delighted to use Dragon Delight for our private tour of the Panda Breeding Center in Chengdu and Beijing. Our guides were all excellent, well informed and spoke good English. They were all flexible with our schedule. I would like to give you our impression of the trip you have arranged for us for your information. (1) Everybody had a grand time on this trip and generally thought the itinerary to be well put together. One important reason why the many one night stays were not stressful was because we did not have to rush in the morning for the next destination. One nighter plus early morning departure would have been bad. (2) The two guides, Jacky for Guizhou and Hill for Guangxi, were exceptional. Jacky's English was excellent and he understood and anticipated the needs of American tourists very well. Hill's English was not as good but he is an seasoned professional and performed very well. We would not hesitate to use either one again. I do think most of my group would have prefer one guide and driver for the entire trip rather than changing as we cross the provincial border. (3) The only negative occurred on Day 2 when we stopped at Tianlong Town. It was only marginally interesting and the lunch there was below par. Fortunately we decided to add Dragon Palace, the underground cavern, as an extra side trip. For your future clients, I would suggest that you replace Tianlong with Longgong. (4) Traveling in Guizhou, having a skillful and careful driver is crucial. En route we saw one car plunged off the highway. I did not see enough of the Guangxi driver to comment but Yang Jun, the driver from Guiyang, was outstanding. He was steady, alert and careful. He amazed all of us with the way he could back up or move into tight corners. As a satisfied customer, I would not hesitate to recommend Dragon Delight to others and I would certainly consider contracting you for my next trip to China. I don't have any trip in mind now and would welcome your suggestions. We are back from our trip to China. We want to thank you for helping us plan the trip. All of the guides and drivers were very helpful and courteous. We especially liked Salina in Beijing and Kimi in Shanghai. Our trip was truly fantastic! I was going to write to you with my comments already. The tour was very well planned and organized. The hotel was very nice, well located and with very nice facilities. The only negative point being that they shut down the entire air conditioning system and the room was extremely hot the entire time. They tried to accommodate us by bringing a fan but that was not nearly enough, the room thermometer marked 26-27 degrees all the time and the windows could not even be opened. They said that it was because of the autumn weather but we found it unbearable and we hardly got a good night sleep. Other than that, everything in the hotel was excellent. PS: We are sorry to hear that you did not get a good sleep at the hotel. October in Beijing is the transitional period from autumn to winter so almost all hotels in Beijing shut down the air condition system. Moreover, it is central air-conditioned in the hotel so it is hard to turn on the air-condition for a room especially. Hope you could understand. Our driver, Mr. Chin was very professional and efficient. Always smiling and very attentive to our needs. Always had water bottles available for us and was always on time and waiting for us by the car. As for our tour guide, Lydia, there are no words to describe the friendly, professional, efficient manner she handled our tour. She had a mountain of knowledge and she shared it with us in a very timely and entertaining way. Thanks to her we began to comprehend many of the aspects of the Chinese culture and Beijing's history. She was very flexible with our requirements and requests and adjusted the tour to our specific taste and needs. She was always there for us, always on time and we never saw her (Mr. Chin as well) attending any other business other than taking care of us. We were very impressed that they were 100% dedicated to taking care of us. She ordered our meals, translated, answered every question and took care of our particular shopping needs. Even the last day, walked us to the airline counter and made sure we were at the right place. At the end of the five days we got to almost think of her as family. Great job Lydia! As for the itinerary, we thought it was well planned and timed. The only two things I would eliminate would be the pearl and jade stops which were boring and tiresome. However, Lydia took us to a tea house that was not in the itinerary ( it was conveniently located at the exit of a site) and that was wonderful. PS: About the pearl and jade stops, they are optional designated tourist shops where trousits could see handicrafts made with a distinctive local flavor and the superb craftsmanship of our Chinese artisans. There's no accounting for taste. Some clients like jade and pearl but others may not. So usually the guide will make recommendations according to the tourists' preference. We will definitely recommend your services. We have a lot of friends asking already and we will tell them to contact you and specially request Lydia as the guide. We had such a great experience that we will contemplate visiting China again maybe next year. We want to see Shanghai and Xian and if we decide, you will definitely hear from me. Thanks again for providing us with a wonderful visit in Beijing. Just a quick note to say thanks once again to each of you for the time and effort you made to make our three-week trip to China so enjoyable and memorable. We’ve been home almost a week now and have settled back into our daily routines of work and home activities. Our friends and family are all very envious of the adventure we had in a faraway land and they look forward to seeing all of our photographs. Cheryl counted them up and we took over 3000 snapshots! Each of your made a significant contribution to making our trip so enjoyable and we appreciate your hospitality and friendship. If any of you ever come to the Los Angeles area, please let us know because we would enjoy seeing you again. We just arrived home a few hours ago and I wanted to thank you for all of your help with our travel to and from Macau to Guangzhou. Ronald was a fabulous guide. Perfectly warm, gracious and delightful to be with. It made the 3 hours drive seem to go by quickly. And yes, I have to admit that your allowances for time were exactly right. Thank you for your suggestions. We did get out of the Guangzhou airport fairly quickly after our domestic flight from Chengdu. I think it was about 30-40 minutes. For our arrival back it took about 35 minutes to get through the Gongbei port and then the 3 hour drive to Guangzhou airport. So we arrived about 2.5 hours before our flight and made the flight in sufficient time. I am just letting you know so you can confirm the travel time and allowances in case someone else decides to travel in the way we did. The restroom stops also worked out just fine. The van was very comfortable to travel in. Although it was not as fast as flying it gave us an extra opportunity to see more of the China countryside and towns, along with learning so much about all of them from Ronald. We were quite pleased with all of the help and how through Ronald was with the details, even walking in with us to the check-in counter at the airport and helping with our luggage. If we know of anyone traveling to China we will certainly recommend your services. Dragon Delight China Tours provided excellent service on my recent trip. Dragon Delight tailored the trip to my special interests in gardens and the countryside while including China landmarks. When planning the trip, I was able to review and revise the itinerary several times to suit my interests and best fit my travel timeframe. The responses were prompt, always within a 24 hour framework. It was a traveling pleasure to have exceptional guides waiting upon my arrival and staying close during the excursions, and then carefully helping with transitions to trains, planes, boats, and waiting cars. Accommodations and the River Cruise were all first class. Dragon Delight is a reliable and professional company and I will use their services again. 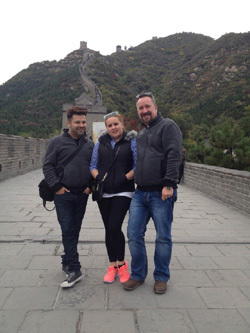 We LOVED our time in China and especially the tour you arranged for us!! The tour guides were fantastic -- especially Jing in Xi'an, Yuan in Guilin, and Qi in Beijing. Also, our guide during the Beijing hutong tour was very good, and could have spent even more time in that area. We learned so much from all of the guides. We loved the amount of sites we visited each day and having free time during the day or in the evening to explore on our own. We felt it was a good balance between tour time and free time. Do you have the email address for Louis/Stella Flood or Larry/Barbara? The other four people (from Ireland) in our group did not return to Shanghai, and we wanted to be able to say goodbye. We enjoyed travelling with them. Thank you again for your excellent service you provided before and during our trip. We have wonderful memories from China. I just wanted to say how wonderful our time in Beijing was. William was excellent. He was timely, knowledgeable and very accommodating. We can't say enough wonderful things about our trip. Your company is amazing!!!! Thanks so much for making our time in china so great. I will be putting a review on trip advisor of how wonderful you and your people were. Thank you for your help in arranging an impressive Beijing China tour for me and my wife earlier this month. You were very responsive and made the tour planning process and arrangements easy and painless. You were very flexible in tailoring the tour to our needs and in accommodating our tight travel schedule. Our tour guide, Victor, was great and very knowledgeable. He provided much interesting information and stories concerning each location we visited making each place very memorable for us. Victor provided us with insightful information into the Chinese culture past and present. He was also able to manage our tours times and scheduled locations despite some unusual weather conditions at the Great Wall and political meetings at Tiananmen Square. He made it possible to see all of the sights we were anticipating to visit and hoped to see plus much more. My wife and I both learned a great deal about Beijing and Chinese history during our visit and tours. In short, you and Dragon Delight surpassed my expectations. You delivered all that you promised . . . a fantastic tour guide, driver, lunch locations, personal tour schedule and a terrifically enjoyable experience. I enthusiastically recommend you and Dragon Delight to others interested in visiting China. Please give Victor and everyone associated with our visit our warmest regards. more than a day wasted, which is common. The suggestions we received were terrific and our return requests were readily accommodated. For a reasonable fee we upgraded to a Chinese style hotel in Bejing for 3 nights and it was absolutely wonderful, well worth the upgrade. It was near a fun area: Bar Street and not far from the lake. I went with my sister and my son and we spent almost no time trying to figure out where to go, which was wonderful and made the trip efficient yet very reasonably paced. The guides were all dear and patient, suggesting we guide how long we wanted to spend different places. We never felt pressured to hurry. The van was comfortable and the drivers were excellent. I would highly recommend this tour company and I was wary as I didn't know of them. I couldn't be more satisfied with our trip. Thanks again to you and to all our most wonderful guides. Each as good as the one before. A wonderful experience. We had the best time in Beijing. The guide Sellinna, she was very professional, smart and polite. My family were very impressed with her. There were times she went out of way to help us. She always made sure we were comfortable. She was never late.The driver was also very professional. She and he,both were always well dressed. Service at Shanghai was not too impressive. It was ok, nothing special to write or complain. First, please accept my apologies for not e-mailing you sooner regarding our wonderful and most magnificent trip to China. Thanks to you and your company, you were absolutely correct when you said "we will always provide More than Excellent Service". All of the arrangements were perfect. The accommodations were just as you described and recommended. And most of all, your guides and drivers were outstanding. In Beijing, Stephanie and our driver were fantastic! In Xian, Echo and our driver were fantastic! And last but not least, in Shanghai, Mark Zhou, was fantastic! What a nice touch the red roses at the airport for our wedding anniversary. It was very thoughtful. Our experience in China would not have been as fabulous if it wasn't for your diligence, professionalism and your knowledge. I highly recommend your services to anyone that is thinking of going to China. You are welcome to use my words as a testimonial. It was a beautiful dream and you made it all possible! Thanks a million! Our family is very greatful! Please extend my regards to our guides and drivers.........we miss them! Again, we cannot thank you enough. 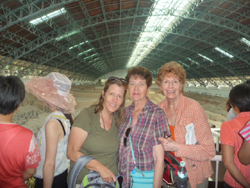 Our family toured China in October 2011 using your company to find tour guides, we enjoyed our trip very much and the tour went very smoothly. Most of our guides were fantastic, Maggie in Beijing was great, really friendly and easy going, while also extremely knowledgeable, she made all the sites come to life. We did not however enjoy having to endure trips to the pearl and jade factories, it was uncomfortable for us to have to spend so much time there especially knowing that we were not interested in buying the goods. Our driver in Beijing was very good, calm and confident and we felt safe even in the most crazy traffic. After Beijing we went to Pingyao, which was different, we had to stay a night in Taiyuan before meeting with the guide Mr Zhang, Mr Zhang was a friendly and polite man but his English skills were not up to scratch. We feel we did not get the best out of Pingyao because we struggled to understand Mr Zhang. We also were made to pay 30 yuan each for breakfast everyday in Pingyao while on our itinerary it said breakfast was provided. Not a huge problem but a little annoying. We then moved onto Xian which was fine, both guides in Xian were good. Chengdu was okay, the guide was good, the driver was not interested in changing the itinerary at all and was quite inflexible. They also took us to the airport at 4pm when our flight was not leaving until 8pm, it was quite a long wait and we felt it would have been more pleasant to have stayed in the city until later, especially as the flight was then delayed until much later. Shanghai was great, our guide there (Ally) was fantastic, she really made sure we saw as much as we possibly could in the very short time we had in Shanghai and we enjoyed our time there very much. Back to Beijing for one night we were greeted by Grace who was very nice and friendly and our old driver Mr Goh (?) and taken back to the Feitian Hotel for our last night in China. The hotels were all great, with good service and facilities and comfortable. The only hotel that could perhaps be more comfortable was the one in Taiyuan but it was for one night only so not really a problem. Overall we enjoyed our trip and meeting the different guides and drivers was part of the experience. Generally everything went smoothly and we had a lot of fun. Our one suggestion is that although you say that we can change our trip if we feel like it on the day, generally the guides and drivers are very reluctant to make changes. Mary and I just returned home from our tour with Dragons Delight in China. We had a very good time although we had to return to the USA two days earlier than we anticipated when we booked the tour. I would like to thank you for assisting us in booking this trip. It was spectacular and just the introduction to China that we hoped for. We particularly liked Bejing and the attractions we found there. Our tour guides were very good--especially Lili in Bejing and Helen in Gulin. All were very friendly, knowledgeable and helpful throughout. I would use them again without hesitation and will recommend them to our friends. Thank you for your assistance in putting this trip together on such short notice and making good memories for us of China. Best wishes. First, let me Say that our 3week tour of China has been outstanding, you have met or exceeded all of your expectations for this delightful trip! Second, Michael Liu has been excellent and flexible in helping us rearrange our Final Day. My son, Jacob Neighbors, is staying here to study at Beijing University and several changes were needed to accommodate his enrollment on Thursday, 22 September. Third, in order to get this done, I have instructed Michael Liu to cancel our plans to visit the Temple of Heaven and the Lama Temple as taking care of family comes first, I do not expect or require any refund for this late cancellation. Thank you and your company for planning our once in a life time, 5 star holiday! We enjoyed our trip to China. The guides and drivers were very personable and professional. They were able to assist us with our travel requests and very adjustable. The hotels selected were good and other travel connections well done. We will be sure to recommend your company to our friends and relatives! I am currently in China now. Tomorrow is the last day of our tour, and we are very saddened. Josh and Dragon Delight China tours are the BEST!!! I cannot say enough good things about this company. 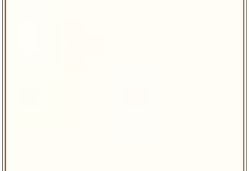 I was also worried about this company at first, and I did not feel comfortable about sending money without knowing more. However, Josh ensured me that everything would be okay, so I made the jump. This company is the BEST and the only one I would trust. I know for sure that Josh will do everything in his powers to make sure you have the best itinerary that will fit your needs. Also, the guides and drivers are wonderful and willing to assist you as they can. At every city, our guides were at the airport or the train station waiting for us. My trip to China went so well that I decided to propose to my long term girlfriend at The Great Wall of China. Jeffrey, if you are going to China and you want the best Josh is your man hands down. I’m not just saying that either. If you have any questions, please let me know. Rest your worries. They will not let you down. Josh will keep good track of you as your going city to city. We would like to thank you for all the arrangements and people you mobilize to help make our trip a great experience. Your people went out of their way to make sure we were taken care of and got us out of quite a few jams. As a suggestion, providing your guest with a Chinese-based cell phone for emergencies would be a nice touch. Once again. Thank you for all your efforts and please feel free to use us for reference. I am slow in responding to you as we went on to HK for a week and then Taiwan for a week on our own. We got back last week and have been fighting the old Jet-lag syndrome. Our private tour of China through Dragon Delight Tours and working with you has been truely Exceptional in every respect. We had Outstanding Guides and Drivers; All of our flights were trouble-free; Our hotels were excellent for the most part; and, Seeing the beauty of China and making new friends was all that we were hoping it would be. We can't stress how delighted we were with your Guides. They All went out of their way to make us feel comfortable, welcomed, and flexible in scheduling to meet our needs. We intentionally kept a full schedule each day as we wanted to see as much as possible and we achieved our goal. Even though we tired at times we had enough flexibility to catch up on sleep and recharge our batteries so to speak. I can't thank you enough for your assistance and whole-heartedly recommend you and Dragon Delight to anyone looking for the chance to design their own tour of China with the support of a very professional and experienced company with the resources to provide All of the support services. We are giving your name to friends and family who may visit China in the near future. We will certainly contact you for our Next China excursion to see all of the places we missed this time. I am writing to express my extreme satisfaction with your services provided during my visit to China. The tour guides assigned to me were excellent. They went above and beyond to ensure my safety and satisfaction. They were very knowledgeable, personable, and their English skills were superb. I will recommend your service to others and hope to visit China again within the next year. We have just returned from our October 10 tour with Dragon Delight. Adam was our guide throughout the trip. We were very happy with the arrangements. 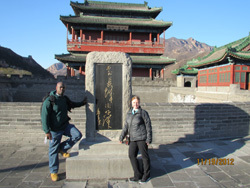 The guides were great - my favorite was Sarah in Beijing but all were competent, professional, and friendly. We stayed extra days for the Expo at the end of the tour where a local travel agency handled transfers. They were always on time and helpful. We were very impressed with your company and how it does business. Thank you! I would have written you a formal letter but i did not know which office to address it . We just got back from our recent tour last Friday. I just want to take this time to thank your company for the very efficient handling of the entire tour. Our tour agent, Adam Lin, was very professional at his job. We were like his family while we traveled to all the places in the itinerary. All the local guides from Beijing to Shanghai filled us with information and historical facts in all the places we visited. We did not lose any luggages or belongings, and all the transportation provided had good drivers. We were also fortunate to have a small group and we got to know one another really well. The Yangtze River Cruise was just perfect for relaxation, getting our laundry done, and enjoying the side trips you offered. The President Cruise Ship had a wonderful and hardworking crew. It would have been nice if you inform future tourists to set aside extra money to tip the entire crew. Thank you also for arranging our trip to the Expo. This China visit was an experience of a lifetime. We felt safe, and well-cared for. We would have appreciated more time to shop at Nanging road, and at the Mosque market. On behalf of my sister, the Ofrecios, and the Sorianos, Xiexie for a job well done. I would highly recommend your company to our friends. We wanted to express our thanks to you and your company for the excellent visit you arranged for us. Despite the very oppressive weather conditions (it was 40 degrees on the second day we were in Shanghai) we had a wonderful relaxed and interesting holiday. Both Jacki and Hansom were excellent in their respective roles of guide and driver. They were not only skilled and knowledgeable but extremely pleasant and interesting to be with. The hotel was of a very good standard- good room, good service and good breakfast. The internet booking process was prompt and efficient. We did not understand that we would have our own driver and guide- thi was a real surprise and bonus! We would be happy for our thoughts to be used in tour tour promotional material. We will certainly be recommending you to friends here when they are considering visiting Shanghai. I just wanted to take a moment to tell you how much we enjoyed our trip to China. Your company was fantastic and all the guides were wonderful. Our guides, Nancy from Bejing, Ken from Xi'an and Mark from Shanghai were always on time both at the airports and our meeting places. All were extremely knowledgeable and most helpful with all our requests. They made navigating China possible. Again Thank you! I would like to especially thank Dr. Yu the doctor on our boat for the Yangtze tour. She is a wonderful, extremely qualified and caring doctor and helped me with some knee and foot problems that might have kept me from continuing the walking part of our tour. Dr. Yu showed such kindness and professionalism that even though it was my first time doing acupuncture, I felt completely confident in her care. I'm now going to find an acupuncturist here in the United States that is familiar with Chinese medicine and begin using them for my knee and foot. Thank you Dr. Yu! You have a wonderful and amazing country and we found the people there simply incredible! If we are ever able to return to China, you can be assured that your company will be the company we contact for the trip. Just a note after our return from China to thank you and your colleagues for the excellent planning of our trip. Everything worked as scheduled without a single problem. It was absolutely wonderful and we have nothing but praise for you. Thanks again and hopefully we'll work together again in the future (maybe when I go back home to Fuzhou in a few years )!! !